Novosibirsk, Nizhniy Novgorod and Moscow. 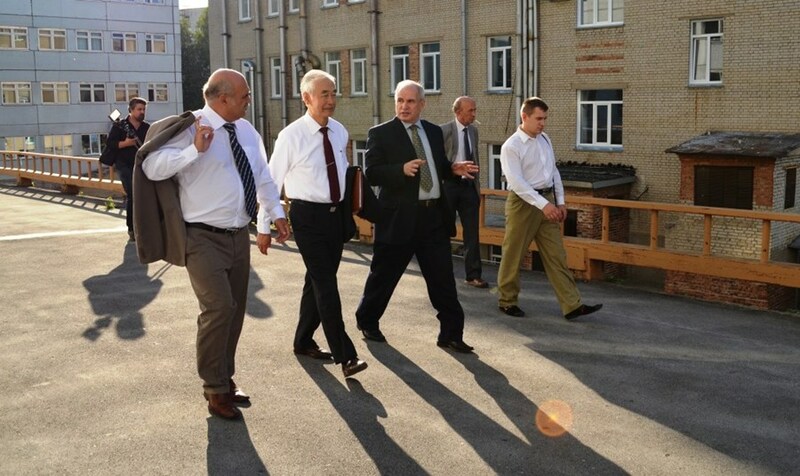 The ITER Director-General Motojima (second from left) visits the Budker Institute (BINP) with the Head of the Russian ITER Domestic Agency, Anatoly Krasilnikov (left), and the Deputy Director of BINP, Alexander Ivanov. During the week of 26 August, ITER Director-General Motojima travelled to Russia, visiting three cities and signing two Procurement Arrangements in four days. Accompanied by Deputy Director-General Alexander Alekseev, head of the Tokamak Directorate, the ITER Director-General began his trip at the Institute of Nuclear Physics in Novosibirsk, where he signed the Procurement Arrangement for Equatorial Port 11 Engineering, for the engineering of diagnostic systems into vacuum vessel Port 11. The Budker Institute will be responsible for the scope of work. The Budker Institute already plays a key part in the development of high-tech electron equipment, engineering of diagnostic systems into the vacuum vessel ports, and research into the investigation of high-temperature plasma impact on reactor's first wall materials as well as developing, manufacturing, and testing equipment for the ITER machine. According to the Head of the Russian ITER Domestic Agency, Anatoly Krasilnikov, equipment development for ITER's plasma diagnostics engineering will take five to seven years and will require constant interaction with the ITER Project's other partners. In all, the Budker Institute will develop five engineering systems for ITER's vacuum vessel ports. The delegation from ITER also visited the Institute of Applied Physics and the enterprise GYCOM in Nizhniy Novgorod, where gyrotron component manufacturing and assembly are conducted as well as the development of infrastructure equipment such as cryomagnetic systems, measurement and technological devices, and part of the energy sources required for the gyrotrons. Procurement of the ITER gyrotrons is a matter of special pride to the Institute of Applied Physics, because it was here that this device was invented. More than half of existing experimental fusion facilities in the world currently use gyrotrons from Nizhniy Novgorod. The final destination stop was in Moscow. At Project Center ITER (the Russian Domestic Agency for ITER), Director-General Motojima signed the Procurement Arrangement for the Thomson Scattering diagnostic system, one of 21 systems that Russia will deliver to ITER before 2024.